In Matthew 7:7-8 we read: “Ask, and it will be given to you; seek, and you will find; knock, and it will be opened to you. 8 For everyone who asks receives, and the one who seeks finds, and to the one who knocks it will be opened. So in this passage Jesus is speaking on prayer. Asking, seeking, and knocking are all basically forms of prayer. They are speaking of us going to God with requests. I don’t believe this passage is saying that we can ask for whatever we want, regardless of God’s will and we will get it just because we ask. I don’t believe that is what it means to be a good father. I don’t give my kids everything they ask for and it is not because I am being mean, it’s because I love them and I am trying to do what is best for them. Sometimes we go to God with things that seem good and we can’t see any reason why it would not be good for us to receive what we are asking for. And yet still God does not give us what we want. Those times are tough. I have a good friend who is a pastor and his wife has cancer. I don’t know why God has not just stepped in and miraculously healed her. There is no reason that I can see for that not to happen. I can only imagine what it must be like to cry out to God again and again and not receive that healing. Sometimes when we cry out to God again and again, and don’t receive what we are asking for, our souls hurt and we can begin to forget who God really is and who we are in him. This passage is teaching us something very important about God. Overall this passage is about prayer, but Jesus is also pointing out that God is a good father. Look at the example Jesus gives in verse 9-11: 9 Or which one of you, if his son asks him for bread, will give him a stone? 10 Or if he asks for a fish, will give him a serpent? 11 If you then, who are evil, know how to give good gifts to your children, how much more will your Father who is in heaven give good things to those who ask him! 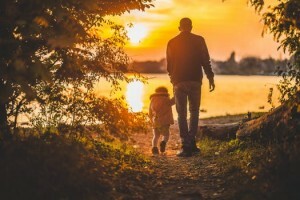 A good earthly father may not always give his son what he asked for, but he is not going to ignore him or taunt him or give him something harmful instead. And Jesus says that if that is true of an early father how much more true is it of God. This is known as an “a fortiori argument” or an argument from the lesser to the greater. If a good early father would respond like this, then think about how much more we can expect from God. God is better than even the best image we could have of what a good earthly father is like. I think I am a decent father and I believe that my children know that I love them and want the best for them. But I know I am far from perfect. I have had to apologize to my children many times for losing my cool, or accusing them of things they didn’t do or lack of patience or other things. I am far from perfect. But I know how much I love my children. They mean more to me than I could possibly express. Recently I was singing the song “Good, Good Father,” by Chris Tomlin. As I was singing I was drawn into the image of how I see my kids. I was trying to put myself in their shoes and if only they could see themselves through the way I see myself looking at them. If they could only recognize how much I love them, not because of how good they are at pleasing me, but simply because they are my children. And then I was thinking, do I see God that way? Do I really see him loving me with the kind of love that I have for my kids, only infinitely greater? I sometimes get a very warped idea of who I am in God’s sight. I can be very performance based in my thinking like I have to please God or always be on my best behavior rather than just recognizing that he is my dad and I am loved by him. And his love for me is not based on how well I am doing, but because I am his child. So as I was singing this song I felt like I was crying out for my soul to get this. I want to know, down deep in my soul, that God is a good Father and I am loved by him. That doesn’t change. It is who he is and it is who I am in him. This passage is about prayer, but it is also a reminder that God is a good father. A few chapters earlier when Jesus was teaching his disciples to pray he used the word Abba, which is a very intimate expression of father. Imagine thinking of God like our daddy. I may not know why God doesn’t answer some of our prayers the way we think he should and I don’t know why some of us are going through the things we are going through. But if I know that my Father God is a good father, and that he loves me and wants what is best for me, then I can rest in him and trust that he will take care of me. Sometimes in our lives we forget that image of God. And in those times it is easy for us to give up and lose hope. But when times are bad, that doesn’t mean that God is not a good father or that we are not loved. In this passage where Jesus uses the words ask, seek and knock, those verbs are all in the present tense. They could be looked at more along the lines of keep on asking, keep on seeking and keep on knocking. I understand what it is like to be tired of asking, seeking and knocking. But I want to remind us today that our God is a good father. Let’s hold on to that image of him, even if we need to cry out to our own soul to remember that. And let’s continue to bring our prayers before him, trusting that he hears us, that he knows what is going on in our lives, and that he loves us very much.